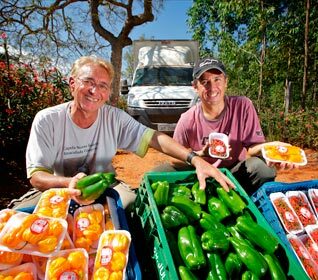 Responsible for 70% of the food reaching our table, family farming has become, with Lula and Dilma, a strategic sector in the country's development. The situation in rural areas, which during the previous governments was characterized by concentration of land holdings, debt and impoverishment, changed radically when Lula was elected President. Farmers began to have access to integrated policies for credit, technical assistance, marketing, insurance and price supports. Created by Lula in 2003, the Family Farming Plan each year offers more resources and adds new advances, constantly revolutionizing the sector. The National Program for Strengthening Family Agriculture (Pronaf) was already in existence, but 76% of family farms did not have access to it. Lula and Dilma extended Pronaf to all of Brazil and multiplied the volume of credit by more than ten times, increasing from R$ 2.2 billion in 2002/2003 to R$ 24.1 billion in 2014/2015. It is important to note that Pronaf’s gains since the first year of Lula's first term were the result of intense negotiations between the federal government and the organizations that represent the industry, such as the National Confederation of Agricultural Workers (Contag), the Family Agriculture Workers Federation (Fetraf Brasil), Landless Workers Movement (MST), the Movement of People Affected by Dams (MAB) and the Small Farmers Movement (MPA). Thus strengthened, family farms help reduce poverty and foster sustainable growth around the country. Symbol of the democratization of land ownership and more job opportunities and higher incomes in rural areas — but considered taboo by conservatives — agrarian reform gained historic momentum during the Lula and Dilma governments. The two together have promoted a record number of settlements, according to Incra: 771,000 families received land ownership titles in the last 12 years, more than half of the total benefits in the entire history of land reform in Brazil. No fewer than 3,902 settlements were established in every state in the federation, adding 51 million hectares, equal to the territory of Ceará and Mato Grosso do Sul combined — the equivalent of 56% of all land already previously made available for agrarian reform purposes throughout the history of the country. And most important: instead of abandoning them to fend for themselves as in the past, the settlers enjoy the support of credit, technical assistance, construction and housing reform, roads construction, installation of water and electricity, high genetic quality seeds, guaranteed sale of farm production and expansion of school education levels, among other benefits. More than a piece of ground, they’ve won the right to plant, harvest and live with dignity. Dilma, gained more legal mechanisms for land reform to help move it along, to reduce the red tape. The procedures for obtaining land titles have been simplified. The regulations for creating new settlements began to contain investment schedules for programs such as My House, My Life and Light for All. Debt repayment became easier with discounts of up to 80%. Executive decree 2013 allows the renegotiation of the debts of 947,000 settler families, 200,000 with Pronaf. They are returned to the production credit system, mobilizing 8 million hectares for food production. Technical assistance, already extending benefits to 349,000 families according to the Ministry of Agrarian Development (MDA), will be extended to another 100,000 by the end of 2014. The estimate is that in five years each settled family will generate an amount equivalent to the value of two monthly minimum wages from production. The order is: land for those who need it, faster and more safely. In 2013, the Dilma government settled 30,359 families, 31% more than in 2012, on a total of 316,000 hectares. According to Incra, on average only 22% of these lands had been in use. Fifty percent of expropriated properties lacked any productive activities. "We are going to encourage family farming, fund it, bring technical assistance to it because, if it depends on this country, no one will go hungry in the world. We already have a corporate farming situation that is second to none in the world. Our family farms should now be able to compete with those in any country, because we have what they don’t have and today we have the political will to do it." We are here today to launch this plan for R$ 24.1 billion in credits foreseen for this harvest. And without a doubt, it is the largest plan hitherto carried out. I wanted to say that these R$ 24 billion represent 10 times more than was invested in the 2002/2003 season and it shows the strength of your efforts. It shows that, besides the fact the government is sensitive and attentive to the importance of family farming and the importance of agrarian reform settlers, it is a fact that we all have learned, the government has learned, you have learned. In the process, we all learn. We want the farmers of this country, small farmers of this country, to have access to the best possible conditions to invest, to acquire machinery and equipment that improve the productivity of your properties and, at the same time, generate more employment and income." "With the government you have peace of mind you are going to ship out your products and your income will come in. Whether it is just a little or a lot, it arrives. Rain or shine, it comes. This is our great reassurance." "Today we have interest rates that have gone from high to low. Which is fair. It is very emotional to recount our history, built with great difficulty. We’ve arrived at a level of living conditions we hope all family farmers will be able to enjoy." "Family farming has come to our community here in Zona da Mata to improve the conditions of the small rural farmer, where before we survived only through our own efforts. Today we are mechanized, we have selected seed, irrigation. And today we receive technical assistance and are guaranteed the sale of our products through local purchases." "It's very exciting to receive a visit from the chief of the largest land reform settlement [program]. In other times, what we received from the State was repression. And after a settlement was built, it was abandoned to demonstrate that land reform should not continue. Productivity is only possible, Mr. President, in this settlement and others in the region ... because of your government. Much has changed in our lives for the better due to your government."